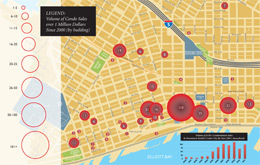 Opus NWR, LLC is extremely proud to be the developer of Fifteen Twenty-One Second Avenue. Over the past 50 years, Opus has developed more than 200 million square feet and some 2,200 projects- all of the highest quality. Nationally, Opus currently has more than 20 million square feet of space planned or under development. Opus also has the honor of being ranked as one of the top ten developers in the country.